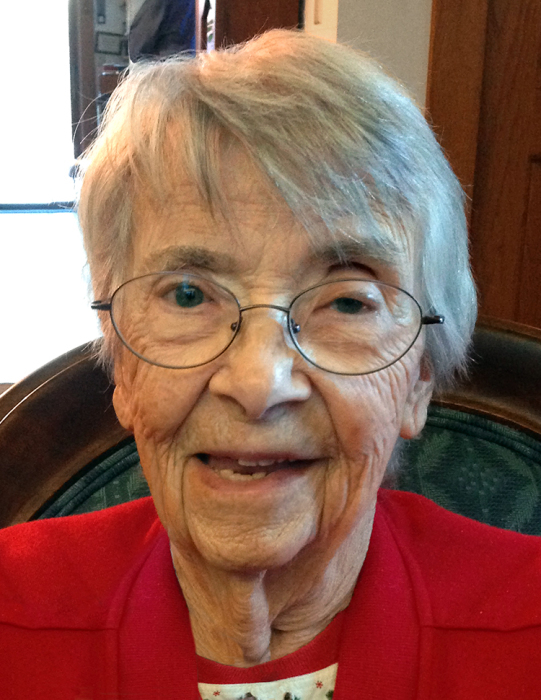 MARY WASS, age 97, of rural Bigelow, died Monday, September 17, 2018, at the Sibley Specialty Care Center in Sibley, IA. Her story begins with her grandparents; independent, stubborn, opinionated, inquisitive, pioneer settlers in Liberty Township, SD and Isanti County, MN. Her parents met when Irene S. Umbehocker went to South Dakota to teach school in the Parkston area, and met a wealthy farmer’s son Leo A. Taylor. They married in 1919 before Leo left for boot camp for World War I. Leo never made it to France, but soon four children arrived, Charles, Mary (born September 3, 1921), Lois, and John. But wealth is fleeting, and when the wheat market crashed in the early 20’s the farm could no longer support them. Leo, a natural mechanic, worked jobs repairing and junking cars and trucks. But in the depression jobs were hard to find, and they often didn’t last long. The little family moved many times, Milltown, Parkston, Mitchell, back to Parkston, and once the house moved with them. Mary went to school in Milltown where she was born, Parkston, and then Worthington MN, when Leo got a job at Martin Chevrolet in 1938, graduating from Worthington High School in 1939. Mary had aspirations to be a nurse, and then a flight attendant, but a congenital heart defect disqualified her from both. Instead at First Covenant Church she met Clarence F. Wass, a swedish bachelor farmer. Love followed, and they were married in the living room of her home in Cherry Point October 8, 1940. The two were a team, and together built a progressive farm in Bigelow Township, and had six children; David, Justin, Nathan, Linda, Brian, and Warren. But that congenital heart defect didn’t go away, and in 1959 Mary had but a few months to live. Her physician, Dr. Vix, suggested she try an experimental heart procedure, and Dr. Schmidt at Northwestern Hospital in Minneapolis performed the surgery. Time has shown that it was a success, and Mary returned to farm life, raising children, baking, sewing, gardening, canning, and at church teaching Sunday School, a Deaconess, Beacon Bible Class, and Covenant Women. She was a member of the Crailsheim Committee, YMCA Pool Committee, and chair of Farm Bureau Women, Gideon Auxiliary, and Nobles County Extension. The children grew up, and moved on to careers in Agriculture, Medicine, Electrical Engineering, Nursing, Architecture, and Farming. Clarence retired in 1977, and the blue Buick spent a lot of time on the road as they traveled, eventually to all 50 states, England and Sweden, visiting the kids, then kids and spouses, and then the grandchildren. They built a retirement home on the farm in 1982 and enjoyed rural life, and she enjoyed straw flowers, beading, bobbin lace, family history, amaryllis, and raspberries. Clarence died in 1997, so Mary lived there alone until 2008 when Justin retired and moved home, which provided companionship for both. When Mary fell and broke her shoulder in January of this year, she moved to the Sibley Specialty Care Center. After a short illness this fall, she passed away on September 17, 2018 at age 97. She was a good mother, loved her family and friends, but most of all loved Jesus Christ her Lord, serving and loving him all her life. Peace to her memory.